Go here to see Daniel and his coworkers at Multivisio. The page is in German, but if you click on Daniel's photo, you can see a form he filled out "Was mich begeistert (what exites me)" and four pictures that excite him including Sydney, Hans and Silke in my dad's backyard, Victoria Falls, bum Santa and a monkey at Mt. Popa in Burma. After a stressful week, we are off to Bologna tomorrow for 5 days to attend a writer/illustrator workshop and the Children's Book Fair. We are fortunate here in Germany to have Good Friday and Easter Monday off so Daniel I used the time to relax, read (I finished "The Story of Forgetting" by Stefan Merril Block that I got at the book fair -very good, and started "Then we came to the End" by Joshua Ferris), do spring cleaning, buy cat stuff (cat carrier, cat scratching cubby hole column, cat bed, cat water fountain, etc), and visit family and friends. Last Saturday I went with Tracy to her church for the Palm Sunday/Easter Passion service. But no Easter bunny or chocolate for us this year. Of course we'd love to have her here already, but we're happy she gets to spend this time with her mother and siblings. I took the train (5 1/2 hours!) up to Bremen to visit Charlotte on Friday. 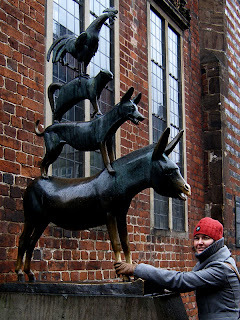 This was my 4th trip to Bremen but the first time I actually saw something of the city. Not as much as I would have liked because the weather was so bad (rainy and so windy you couldn't carry an umbrella), but something. We also took a short walk around the old town and around Charlotte's neighborhood. And we cooked some yummy meals like lentil soup and mashed pumpkin with roasted pumpkin seeds.